Activated Carbon Filtration | HP-Series | General Carbon Corp.
GC HP-Series Liquid Adsorbers are designed for industrial and municipal applications where large volumes of water at high pressure are treated. HP systems can be provided in single tank or duplex configurations. Duplex systems are skid mounted with a valve “tree” allowing lead/lag or parallel operation and the isolation of either tank for service. HP Series units are built to ASME Code Section VIII Div. 1 standard and can be “stamped” if required. Standard coatings are two part Epoxy inside and outside with a complete range of commercial coatings also available. PVC internals are standard with stainless steel screens available. The adsorbers are outfitted for the hydraulic transfer of GC 8×30 or GC 12×40 carbons. 1 Flow Rate at Loading of 5 gpm/ft.2 Bed Cross Section Area through one tank. 2 Pounds of Carbon is for Density of 28 lbs./ft.3 and allowing 50% Bed Expansion for Backwash. 3 Empty Bed Contact Time for given Maximum Flow. Installation & Startup – HP-Series adsorbers are shipped empty along with the required activated carbon. The adsorber should be connected and all fittings pressure tested for leaks before the carbon is installed through the top access hole. After the carbon has been loaded, the unit should be filled with clean water through the bottom collector, and allowed to degas for 8-12 hours if possible. Backwashing the carbon is recommended to remove carbon fines that can cause excessive pressure drop through the unit. Multiple units are usually connected in series with testing between the units advised to determine when the first unit needs to be changed out. Maintenance – The only maintenance the HP-Series adsorbers require is the testing of effluent quality, and checking the operating pressure of the system. Monitoring the contaminant level into the last unit in a series arrangement is the recommended safeguard against having breakthrough in the final outflow. When the concentration of contaminants in the flow coming out of the lead unit equals the concentration of the flow into the unit, the unit has reached its removal capacity and needs to be serviced. The working life of carbon is dependent upon the type of contaminant in the water as well as its concentration and the liquid flow rate. A pressure relief device is advised to prevent damage to the system in the event of excessive pressure buildup. Backwashing an adsorber that is operating at an elevated pressure will sometimes provide a temporary lowering of the pressure drop through the unit. Servicing – Once an HP-Adsorbers carbon is saturated by contaminants, the unit should be taken off line and fresh carbon installed. To purchase replacement carbon or to arrange for a carbon change-out, please contact our office. Disposal – If you change the carbon out yourself, please dispose of the spent carbon in accordance with Local, State and Federal regulations. Available Options – Custom features are available for special needs. 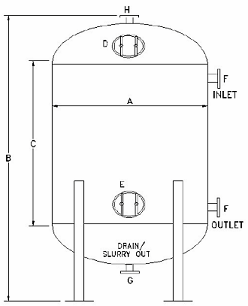 ASME Section VIII Code Stamp, stainless steel tanks and/or internals, food grade or severe service coatings inside or out, custom sizes for space limitations and different connection locations for hookup to existing plumbing are routine requests. Please call us with your needs.